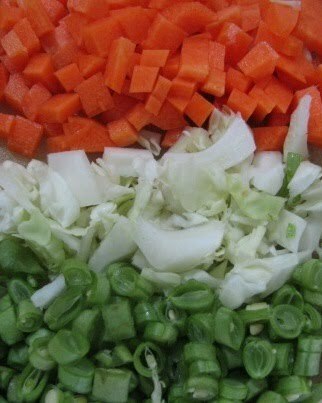 I chose these veggie for our Independence Day Celebration by Akila. This curry was very tasty with steamed rice. I dedicate this to everyone fighting for our Country. Wash and cut all veggie into small pieces. Put frozen peas in water. In a Kadai, heat oil add mustard and hing. Then add urad dal and curry leaves. When dal is brown. Add all veggie, salt, turmeric and mix. Add water to cook the veggie well. Press a Carrot and check when its cooked. Add the masala powder and mix. Cook for 5 mins till the raw smell goes. If you wish you can mix it with rice or serve as it is. Serve with hot steamed rice or chapathi. This is also a perfect one for lunch box. This is also going to Show me your Curry by Divya. Wow what tempting curry!!! I must try it soon. Lovely and delicious and pretty colourful too. 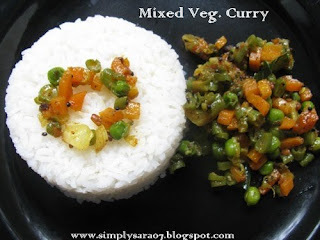 Nice n very colorful curry...luvly pics. nice and colourful mixed veg. curry...perfect to have with chapathi. Please have a look at my blog. I would be very pleased if you like to follow my blog. 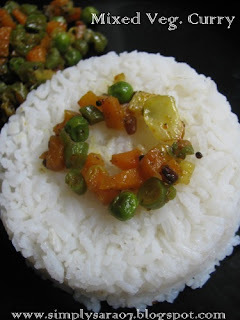 ரெசிப்பியும் அந்த ஃபோட்டோவும் போட்டி போடறது..
Looks delicious. So lovely to see the Independence day celebrated in so many different ways.